Blessed Thomas Mary Fusco was the seventh of eight children and was born on December 1, 1831 in Salerno, Italy. His father was a pharmacist, and his mother was of noble descent. They were known for their strong moral and religious conduct, and taught Thomas Christian piety and charity to the poor. His mother died of cholera when he was eight years old, and two years later his father died. His uncle Fr. Guiseppe was a primary school teacher, and he became responsible for Thomas’s education. As a little child, he dreamed of becoming a Priest, and in 1847 he entered the diocesan seminary of Nocery, and was ordained a Priest in 1849. Because of the loss of his parents, and then his uncle Fr. Guiseppe in 1847, also his younger brother Rafael in 1852, he had a strong devotion to the Patient Christ, and His Blessed Sorrowful Mother. His devotion to the crucified Christ was something he cherished throughout his life. He worked with the formation of boys, and opened a morning school in his own home. He worked to increase the human and Christian formation, and also organized evening prayers in the parish Church of St. Felice e Corpo di Cristo. In 1857, he was admitted to the Congregation of the Missionaries of Nocera under the title of St. Vincent de Paul and became a missionary in the southern regions of Italy. In 1860 he was appointed chaplain at the Shrine of Our Lady of Carmel in Pagani, where he built up the men and women’s Catholic associations and set up the Altar of the Crucified Christ and the Pious Union for the Adoration of the Most Precious Blood of Jesus. He opened a school of moral theology in his own home to train priests for the ministry of confession in 1862. He also founded the Priestly society of the Catholic Apostolate, for missions among common people and in 1874 he received the approval of Pope Pius IX. He encountered a young orphaned girl in the streets, and was so moved that after prayer, he founded the Congregation of the “Daughters of Charity of the Most Precious Blood”. This Congregation was inaugurated at the Shrine of Our Lady of Mount Carmel in the presence of the Bishop. The first three Sisters received their habit at this Church, as was the first girl’s orphanage for the area. It wasn’t long, and this Religious Order and Orphanage received the Pope’s blessing. Blessed Thomas continued to dedicate himself to his Priestly ministry, spiritual retreats, and missions. From his Apostolic travels many new houses and orphanages were built, and this was a result of his heroic charity, which only grew in the last twenty years of his life. Blessed Thomas Mary Fusco had a terminal liver disease, and died on February 24, 1891 at the age of 59. He was praying, “Lord, now let your servant depart in peace, according to your word”, LK 2:29. His Obituary read, “Thomas Mary Fusco, Apostolic Missionary, Founder of the Daughters of Charity of the Most Precious Blood, an exemplary Priest of indomitable faith and ardent charity, worked tirelessly in the name of the Redeeming Blood for the Salvation of souls, in life he loved the poor and in death forgave his enemies”. Pope John Paul II beatified Thomas Mary Fusco as an example and guide to holiness for Priests, for the people of God and for his spiritual daughters, the Daughters of Charity of the Most Precious Blood. 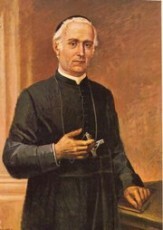 Blessed Thomas Mary Fusco was orphaned at an early age, and was raised by his uncle who was a Priest and taught school. Thomas was very spiritual and became a Priest. He was an Apostle of Charity of the Most Precious Blood. He practiced the heroic virtue of charity, and opened many orphanages for boys and girls. He founded a Religious Order, the Daughters of Charity of the Most Precious Blood, and spent his life helping others. Pope John Paul II, beatified him in 2001, and his life is an example and guide to holiness for Priests, people of God, and for the Daughters of Charity.